The PGM is a recipe-driven system that increases the ability of a tire manufacturer to supply consistently round tires, with identical diameter and profile, to the most demanding end-customers. 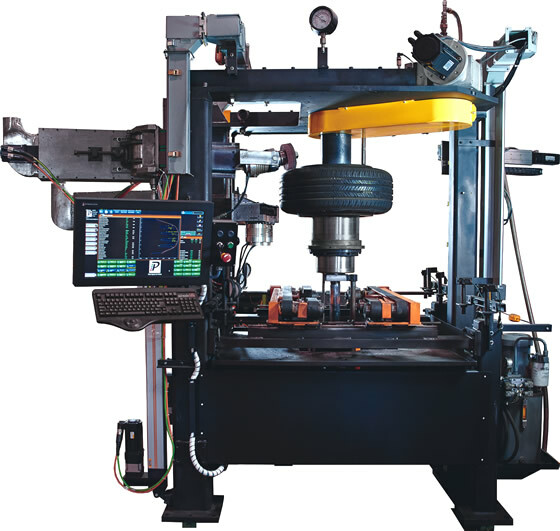 Patented worldwide, PGM uses dual precision grinder units, a laser, and a Windows-based controller to reduce radial force, radial runout and conicity -- without compromising finished tire appearance! Consider the results of this recent trial, charted below. Before profile generating, the radial runout of a locally purchased, 15” replacement tire was 0.0367” and radial peak to peak force was 22.4 lbs. After a profile scan and grind of 0.028”, the new test waveform shows 0.0035” radial runout and a drop to 17.6 lbs of radial peak to peak forces. Conicity also was corrected from -5.2 lbs. to +0.3 lbs. ”off the outside diameter of the tire in two passes within a cycle that totaled 103 seconds. The recipe screen makes it easy to define finished tire parameters, by tire type. PGM can calculate the target profile from recipe parameters, or retrieve it directly from either an uploaded CAD file or stored scan of the perfect master tire. The initial tire scan indicates the center of the tread, which PGM compares to the centerline of the machine. This method provides a precise grind path for each tire type, regardless of tire width. The patented dual grinders move in tandem to generate the new profile, reducing grind time by half. With PGM, you can now use your bar coding system to locate and correct objectionable tires produced by a mold with a repeating irregularity. PGM can also communicate with a plant information system to obtain a recipe, and then adjust grinding criteria for bar coded tires, without operator intervention.